A slip turn from the Frascati Road onto Mount Merrion Avenue — the council plans to reduce the size of the lane. Upgrade plans for the Blackrock bypass in Co Dublin includes left slips turns which one state agency branded a “significant risk” to pedestrians and cyclists. Two sets of design guidelines recommend removing these slips from urban areas. Dún Laoghaire-Rathdown County Council, in a report on the plans, says that it is “committed to providing high quality pedestrian and cycle facilities” and that the upgrade is design to “improve the pedestrian and cycle facilities”. However, the council’s plans for Frascati Road and Temple Hill goes against guidelines covering slips turns, having pedestrian crossings on all legs of junctions, and omitting staggered crossings. 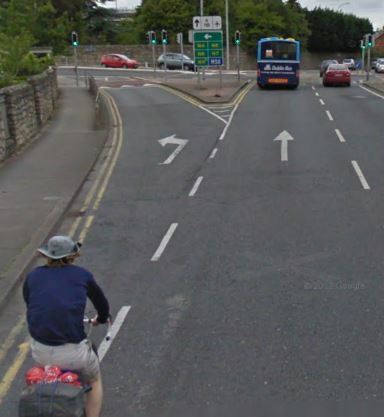 Slip junctions are retained at a number of locations, including at Mount Merrion Avenue, at the main access to Frascati Shopping Centre, and access points into and out of Blackrock Village — just one slip junction along the route is to be removed and another is to be converted into bus-only. Other official advice in the National Cycle Manual, produced by the National Transport Authority (NTA), says that the slips turns “often gives drivers an unreasonable sense of priority,” allows “vehicles to take corners at higher speeds” and “restricts views of cyclists and pedestrians”. “The scheme should reconsider the need to provide left slip lanes as part of the scheme. Conflicts between large turning vehicles and cyclists/pedestrians on left slips present a significant risk. Side swipes can a also occur with weaving vehicular traffic. Omit left turn slips, which generally provide little extra effective vehicular capacity but are highly disruptive for pedestrians and cyclists. Of the left turn slips currently in place controlled by a yield sign or a flashing amber traffic light, adjustments are to be made on some to narrow approaches or radii, but most are to be retained as merge-based turns against advice from the NTA and departments. Advice on pedestrian crossings in the Manual for Urban Streets and Roads also says to omit staggered/staged crossings, where pedestrians are not directed straight across the road or where traffic lights only show a ‘green man’ for part of the way across the junction, forcing people to wait a number of times to cross one road. Some cyclists and pedestrians are also likely to be unhappy with other details. This includies crossing and short sections of footpaths which are due to be shared between cyclists and pedestrians — generally referred to as “shared use” paths. Campaigners representing cyclists and people who are blind are on record as being against mixing pedestrians and cyclists in this way on main roads. Dún Laoghaire-Rathdown County Council says that the proposed dedicated cycle facilities along the length of the scheme will be of a high quality and “will be in accordance with the recommendations in the National Cycle Manual”. The council’s public consultation on the plans runs until Monday 21st October 2013. Drawings and supporting documents are online at dlrcoco.ie. Submissions and observations can be sent to traffic@dlrcoco.ie. Whilst the installation of cycle lanes along this road is obviously welcome, this scheme is in need of total review. It really is half baked (to put it politely). One interesting point, I noticed the plans are dated February 2013. Why so long till they came out? Also design manual came out in March. Would you not review the plans after such significant policy came out? What is going on? I was on Temple Hill about a week ago and had the problem of trying to get passed these slip roads successfully.There are two on the Hill heading outbound that are very unpleasant. When you are going up the Hill you have to go out to the right to stay on the straight ahead lane all the while the Traffic tries their best to shoot down the slip road past you at speed,pretty nasty. You are trying to get over to the right and build up speed on the Hill so you wont be caught out by the speeding cars. Then when you get to the top of the Road you have the same problem with the Junction of Monkstown Road and Stradbrook Road.It is not so bad coming down a hill as you are not struggling as hard to gain speed and it is easier to get out of the way of approaching Traffic. The wider Slip Roads are the worst. Echoing the NTA’s Hugh Creegan’s concerns about slip-turns please could we see the Road Safety Audit Report for this scheme posted in a public area on DLRCC’s web-site. You would think as they are doing this upgrade costing a lot of money that they would get it right first time,instead of grudgingly coming back to it a year or two later and fiddling around with it. It is the same with any kind of Infrastructure in this Country be it Roads or Cycle Lanes or Pedestrian facilities. They just put in something that suits Motorists then try and change it after it is put in and the money spent. …to suit motorists – are you joking? This road is being hacked out of it to give less than 500 cyclists a day priority. All traffic (30,000+ that is), including buses and utility vehicles will have to make do with 3m traffic lanes. That will affect the ride quality for bus passengers. Of course, you’re fit adults, so I guess that the transport needs of young children, parents/carers doing weekly shopping, the elderly and people with mobility issues don’t figure. Err.. I think you’ll find that 3 meter traffic lanes are used on arterial roads in other countries, including the Netherlands. If it’s really such an issue for some people the speed limit can be reduced to 50km/h or even 40km/h. Truck drivers should have no problems — I observe trucks on a daily on a road that is more winding with narrower traffic lanes, and truck drivers display the best lane discipline out of all users. Bus drivers also deal with narrower bus lanes in more confined situations on a daily bases. As for cycling and “fit adults” — fit adults are the only ones which the old design even half catered for. The new design will make it more possible for children, parents, the elderly and people with mobility issues to cycle. As for people who need to driver all or some of the time, you have yet to make it clear how 3 meter lanes are going to affect those groups of people when large trucks can fit into 3 meter lanes. Actually it would be great if they made the speed limit slower,it will make it a lot safer on that road for all users.